A condition affecting cattle fed on grains containing chlorinated naphthalenes, which is characterised by hyperkeratotic induration of mucocutaneous surfaces. 1. hypertrophy of the horny layer (stratum corneum) of the skin, or any disease characterized by it; the hyperkeratoses may have distinctive formats, e.g. annular (ring formations), basket-weave, compact, laminated. 2. hypertrophy of the cornea. increased thickness of the keratinized epidermis of footpads in dogs and rarely cats. May be in response to trauma or associated with distemper (hardpad disease), or pemphigus foliaceus. a form of ichthyosis in humans which is inherited as an autosomal dominant trait; there is severe degeneration of the granular layer of the epidermis. 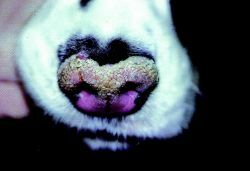 a crusting dermatosis over bony prominences, face and chin of young dogs. See zinc-responsive dermatosis. an abnormal thickening, sometimes with fissures, of the planum nasale of dogs. May occur in association with digital hyperkeratosis (see above) as a feature of distemper (hardpad disease). Also seen in pemphigus foliaceus and discoid lupus erythematosus. see nasal hyperkeratosis, digital hyperkeratosis (above). hyperkeratosis with non-nucleated cells present. hyperkeratosis with nucleated cells present; called also parakeratosis.